Google's upgrade of Chrome to 2.0 is exceedingly underwhelming --- there's so little new that if you blinked you'd miss the changes. It's baffling that a company that keeps fully featured software like Gmail in beta for years has jumped to 2.0 for a browser with so little to offer. After the upgrade, you won't notice a change in Chrome at all --- it looks just like the previous version, and largely behaves like it as well. There are a few little tweaks, though, such as a full screen mode available via the F11 key. There's also a form filler for filling in Web forms, something other browsers have had since the Dark Ages. You can also remove thumbnails from the "New Tab" pages that launch whenever you open a new tab. And you can zoom better. The only substantial change is speed. Google claims that the new Chrome is 30% faster than the previous version, and I can believe it. It loads pages lightning fast. But there's more to browsing the Web than fast-loading pages. That's where Chrome 2.0 is still far inferior to Firefox and Internet Explorer. 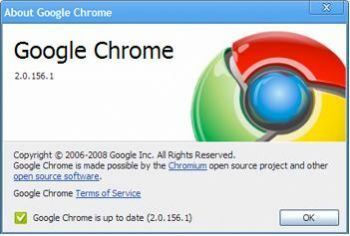 It's hard to understand Google's plans for Chrome, because it's so bare-bones that it will never gain significant market share. It may be, though, that Google considers its browser little more than a front end for Web-based applications such as Gmail or Google Docs, and figures that the applications themselves, not the browser, is where most functionality will reside. But the ubiquitous cloud-based world is still far away, and until then, Chrome will languish.